Join us for an InterNations Soirée! 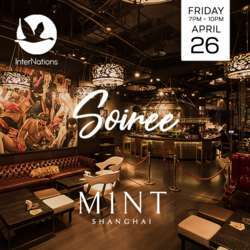 This time inside the VIP Lounge of the most iconic club in Shanghai and New York, M1NT. The only Member's Shareholder club in the world, there's nothing quite like M1NT... wait until you see the 50 meter shark tank. Dress code is smart casual chic. • DiDi English Ride-Hailing service giving you 20% off your next DiDi ride, like the one you take to our event! Simply scan the qr code of the image included in the event photos now. Offering 30% off to Albatross members. Simply show them your Albatross membership status.